The Chaverim Project was started by the youth group of Temple Emanu El connecting NFTY youth with other young people in Reform communities around the world, specifically in the Former Soviet Union, to send youth to Netzer summer camps from the World Union. While serving on the World Union’s North American Advisory Board, Linda Zoll was asked how she planned to use her position to help Progressive Judaism. Having the opportunity to help young people embrace their Judaism was exactly how she wanted to assist the movement. 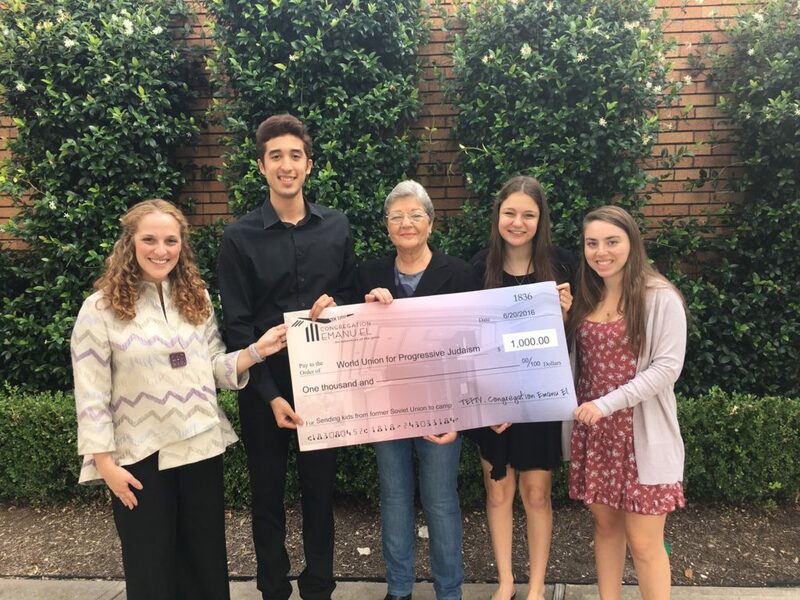 Zoll, with the partnership of Temple Emanu El’s youth group, TEFTY, in Houston started the Chaverim Project. This project is defined as the partnership of NFTY with communities around the world, specifically to the Former Soviet Union, to send youth to Netzer summer camps from the World Union for Progressive Judaism. “I did this for the young people in North America to recognize they have the opportunity to impact and the ability to change the future of Reform Judaism,” Zoll said. TEFTY, under advisor Megan Brown and president Marisa Papell, raised $1000, enough for one child to attend the 12 day camp in the FSU. Zoll is a member of the international advisory for the WUPJ, in addition to her position on the board. The idea came to Zoll after attending the WUPJ conference in San Francisco, and learning about the efforts the World Union is trying to push in an area of the world where the majority of Jews are living with little to no knowledge of their Jewish roots. These camps, Zoll said, now give the children the opportunities to come back to their families and teach them of their shared traditions. When Zoll proposed this fundraising idea to the youth group, the children were immediately connected. Through a series of bake sales, TEFTY had raised the $1000 goal and learned more and more about the camps through the process. Reading biographies from campers and doing personal research on the diaspora of Jews in the region, the teens continued their motivation through the fundraising process. TEFTY is considered the “pioneer group” of the project, being the first youth group in North America to fundraise and reach the goal to send a child to camp. Chaverim is currently in the process to be included on the agenda for NFTY convention held in Chicago this coming February. With this on the agenda, it is the goal for the project to then be carried out by youth groups across North America, continuing the international connection. Due to the success of the youth group, other members of the congregation also felt motivated and matched their fundraising amounts, sending more and more children to the camps. Reaching the fundraising goal was for the kids themselves, being the highlight of their year, Brown said. “The kids walked away from this experience knowing they gave the experience of camp to somebody else,” Brown said. Please fill out this form to share "Chaverim Project Connects Jewish Youth Across our Global Movement" via e-mail.